Colored fonts are now supported in Windows 8.1 (e.g. Segoe UI Emoji). You can now choose between Smooth, Sharp (Modern), and Sharp (Classic) rendering. These correspond to the DirectWrite’s rendering modes of Outline, Natural Symmetric, and GDI Classic. OpenType/Adobe fonts are now included in the list of fonts. Fixed some layout glitches that caused text to be incorrectly clipped and/or the cursor to appear in the wrong location. Drawing a rectangle selection with a fixed ratio followed by a Crop operation was often resulting in an extra row or column of partially transparent pixels. When using aliased selection clipping while zoomed in, the selection was often rendered in the wrong location and/or at the wrong angle. When drawing a rectangle selection, the status bar would always say it had zero area. Selection adjustments would sometimes result in half-pixel alignment of the selection outline. Deselecting via pressing Enter or Escape was not working consistently. Fixed some rendering artifacts when scaling the selection to a small size. Fixed some rendering glitches after pasting when a selection was already active. You can now use the middle mouse button for panning at any time. Panning via spacebar while a selection tool was active didn’t always show the correct mouse cursor. UI text now honors the user’s control panel settings for ClearType and antialiasing of text. Edit->Copy now includes the PNG format when initializing the clipboard data, which allows applications like Office to paste with full transparency information. The Diagnostics page in the Settings dialog now includes a “Copy to Clipboard” button and a “Open crash log folder” link. The Eraser tool now uses the alpha value of the current color. Double-clicking the “roll ball” in Rotate/Zoom was not resetting all the values to their defaults. Fixed some visual artifacts when using the Line or Curve shape along with certain arrow end caps. Ctrl+[ was not reducing the brush size by 5. Fixed a crash in the Move and Shape tools when adjusting the rotation anchor while using the Classic theme on Windows 7. Some of the new toolbar items didn’t have tooltips. When hovering the mouse over a taskbar image, the main window was always showing a blank image for the corresponding tab. Fixed a bug in the Colors window where it would incorrectly switch to the Primary color when you clicked on the Hue slider. Removed the legacy Ctrl+Alt+0 keyboard shortcut for View->Zoom to Actual Size, which was preventing some characters from working in the Text tool. I love the UI text being not anti aliased any more. Panning with middle mouse is so handy. And the custom taskbar image instead of a window thumbnail is really cool. Gets better and better - thank you! i reproduces the crash several times. Diese Textdatei wurde erstellt, da paint.net abgestürzt. Bitte Email dieses zu crashlog@getpaint.net, also können wir diagnostizieren und beheben Sie das Problem. bei PaintDotNet.Tools.TransactedToolToken.Dispose(Boolean disposing) in D:\src\pdn\paintdotnet\src\PaintDotNet\Tools\TransactedToolToken.cs:Zeile 130.
bei PaintDotNet.Disposable.Finalize() in D:\src\pdn\paintdotnet\src\Base\Disposable.cs:Zeile 297. "Stirke Through" of the Text tool does not seem to strike through, but underlines. I seemed to encounter this too, but after it said "Paint.NET encountered an error and needs to close," it didn't close and I went right on pasting and dragging. Great tool! Keep up the great work. Small bug; when installing I checked the option to check for pre-releases (beta), but when opening the settings window, this option isn't checked. 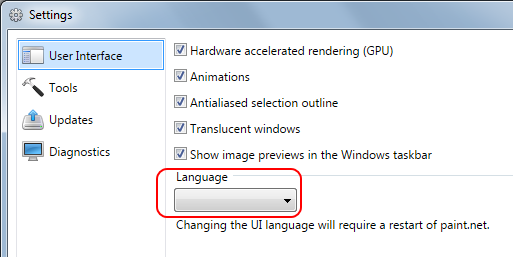 Another small bug; languages dropdown doesn't show current language (see attachment). Does show again when opening dropdown. Select another tab then "User Interface". Select tab "User Interface" and see clear language dropdown. Also, I have one feature request. Can you add a confirm message after opening multiple files (without editing) and pressing the program close button. Make a white layer, add new layer set to color burn, draw a black and [insert favorite color that isn't black] gradient. Not sure what you could do about that. I really like the dithering on gradients, otherwise. Thanks for the awesome program and hard work! 2. Go to line tool and set end caps as rounded. 3. Draw line, the end caps will still be flat. 4. Rotate line and the rounded end caps suddenly appear. 2. Click on the secondary color (probably white). 3. Try to change color. It changes the primary instead. It didn't use to do this before, correct? In color window, if you slide the V slider back and forth (especially if you go to the far left and back to the far right), it changes the RGB values to a whole different color every time you slide back/forth. Not sure if this has been reported before, but whatever happened to Bezier curves? Right-clicking the handles does nothing special like it used to. Is PDN no longer an Open Source project? I opened the zip file, but it is just an executable. No code. Paint.net has not been open source for many years. Bezier curves are currently not implemented. I'm not sure many people even use them? I think they're also unimplemented because I had a billion other things to do and decided to skip past this at the time as a stress-reduction technique. I can add them back if people actually want it, I just have to do some math. I had totally forgotten about them. I use them more or less frequently, and I'd find it a huge pity if you ended up not reimplementing them. The choice is yours of course, I'm just saying would keep a copy of 3.5 around for Bezier curves' sake. I also quite enjoyed bezier curves, they were very helpful in making smoother curves. I usually used them over the normal curve. Of course, as vvye said the choice is yours, which is why I didn't mention their absence earlier. Yes, I use Bezier curves all the time in my goldwork. Without Bezier curves I will not be able to make the frames for much of the jewel-type images. Of course, I can keep a copy of 3.5.11 for this like other posters above but it would be a shame to lose BC. 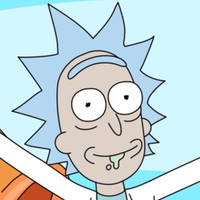 Pretty please consider it, Rick. On the other hand, the new curve tool is much MUCH better than the previous (not better than bezier curves, but good enough that I can live without them). When I add a shape to my image and press "Delete" while still in edit mode, I'd expect the shape to be removed. Currently it's just finished then, which is definitely not the expectation when you hit "delete" with an object selected. Edit: Btw, where is the correct place to suggest improvements? Here, or is this just for bug reporting? If here: I'd love it if the rotation-center of shapes had a toggle button to determine whether to pin the center when the shape is dragged or not. Currently, the center is moved with the shape when it's not been relocated, but it stays where it is when it was dragged somewhere else. Instead, I'd suggest a toggle button next to the center, depicting a pin needle icon. When the button is active (i. e. it appears pressed), the rotation center is pinned to its coordinates and remains where it is if the shape is moved. When the button is not active, the rotation center is translated with the shape. This would allow to re-locate the rotation center first (e. g. to the corner of a rectangle) and then move the shape afterwards without having to re-arrange the rotation center all the time. That's just a consequence of how the rendering system works. Completely by-design. You can turn off dithering by turning off antialiasing in the toolbar. Aha! That's what that button does... Good to know!